Toad Hall Toys Annual Sidewalk Sale! 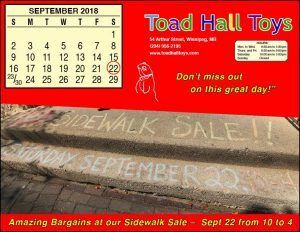 Every year Toad Hall Toys has a great sidewalk sale – it’s lots of fun and there are tons of amazing deals! The sale is on Saturday Sept. 22nd from 10am to 4pm. A lot of it is set up outside on the sidewalk, but you can’t shop til 10am. You can scope out what you want beforehand though. Usually people will go right to the area that they want – like Playmobil, games, crafts, costumes etc. It’s a great time to do all your Xmas shopping at once, or pick up gifts for parties during the year. We usually stock up on games and fun stuff to do in the winter. It’s really busy and things move fast, good idea to bring a bag to load your stuff in, or bring a spotter who can hold the stuff you pick out while you shop. They are located at 54 Arthur Street, in the Exchange. « Get ready for SampleSource this month and make sure you are registered!